My life, under the microscope...: February 27 work in progress, etc. February 27 work in progress, etc. Sorry I've been so bad about blogging lately. No good excuse, just haven't been in the mood for it. 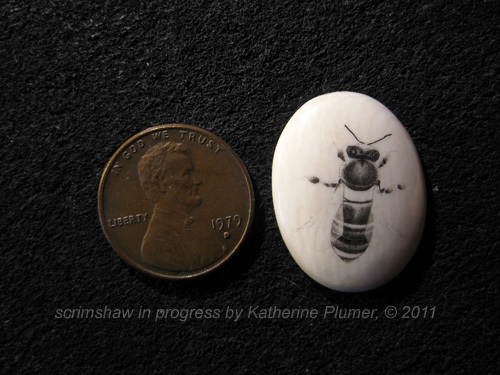 I am working on an order for another scrimshaw bee pendant. The bee itself will be pretty much exactly the same as the first one that I did (well, aside from the fact that since it's done by hand and each piece requires a fresh batch of ink it therefore will of course be somewhat different...). This pendant will be oval instead of rectangular though. I'm really making an effort NOT to look at photos of the first bee pendant I did, since I don't want to get hung up on wondering exactly how I did it and exactly what colors I used. Just want to go for it anew! I've started with the darkest areas. For other entertainment, here's a carefully arranged photo of a chocolate peanut butter cheesecake that I made. It cracked badly, my cheesecake baking skills need honing. Sometimes I get it just perfect, other times not! Clearly I need more people in my life to come over and eat cheesecake so I can practice more! I seem to have officially started collecting eggs for hatching. They produced a whopping zero eggs yesterday and a whopping two eggs today, so I guess that's a start. I'll fire up the 'bater mid week and make sure it's running well. Finally my girls are starting to lay eggs again. My whole family is starting to look at me in disbelief when I say I don't have any eggs for them. We're barely feeding ourselves. WOW that cheesecake looks yummy. I love the little fellow you sent. How did you get the fancy design on the top? From your cheesecake illiterate friend. -BMc. 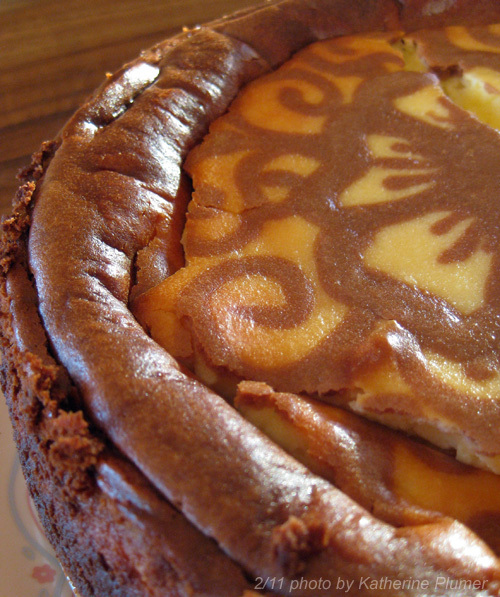 You could always do a scrimshaw of (or on) a cheesecake... That would be the best of both worlds, or something.